The Black Russian Terriers are also known as Black Terrier, Tchiorny Terrier, Chornyi, Russian Bear Schnauzer and Russian Black Terrier. It is not a true terrier and is thought to be made by mixture of twenty breeds, some of which include the Giant Schnauzer, Airedale, the Rottweiler, the Newfoundland, and the extinct Moscow Water Dog. 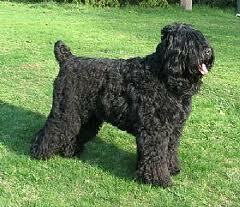 It is a large size dog, extremely efficient and easily adapts to various climates and owners life-style. It was initially used as guard dogs and police dogs, however now it is a friendly companion who would enjoy accompanying you in various activities such as fishing, cycling, swimming, hiking etc. This breed of dogs is considered to be healthy and lives on average for 10-14 years. Nonetheless, this too like other breeds is prone to few hereditary diseases which include hip dysplasia, elbow dysplasiaand progressive retinal atrophy.